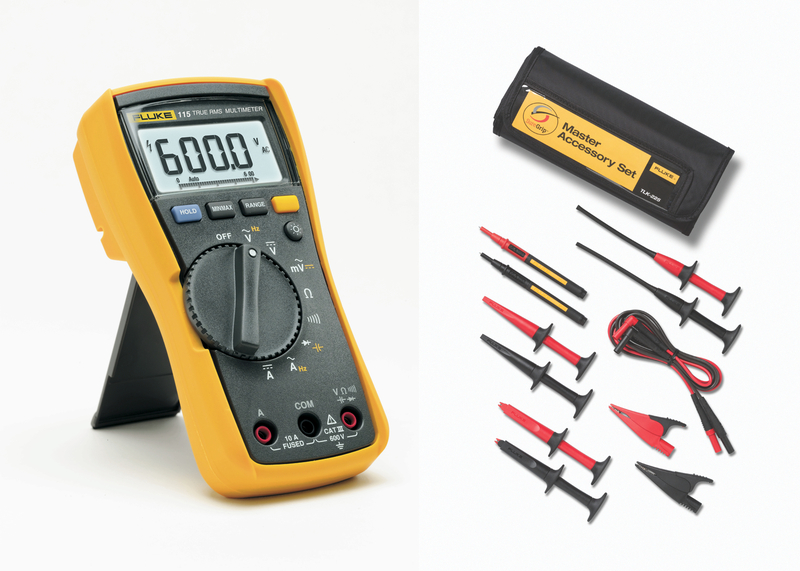 Until June 30, 2018, Fluke is offering a DMM Safety Bundle consisting of a Fluke 115 digital multimeter (DMM) with a Fluke TLK-225 SureGrip master accessory set of leads and connectors, representing a discount of over 40% on the items purchased separately. The Fluke 115 DMM true-rms meter, with a CAT III 600V safety rating, is designed to be a meter for a wide variety of electrical and electronic testing applications. Featuring a large white LED backlit screen, it measures DC and AC voltages to 600V and captures MIN/MAX/AVG readings. The Fluke 115 also measures resistance, frequency and capacitance, and tests continuity. The Fluke TLK-225 SureGrip master accessory set consists of 13 items, providing flexibility and comfort with all SureGrip leads and probes in a convenient six pocket, roll-up pouch. Rubber overmoulded surfaces and curves are designed to give the user a comfortable, reliable grip on the accessory so they can focus on making an accurate measurement. Also included in Fluke’s Spring Campaign are a Fluke TiS20 thermal imager at a special price; a Fluke T150 voltage and continuity tester with a free H15 holster; and a Fluke 1663 or 1664FC multifunction installation tester with a free Fluke T130 or T150 two-pole tester and free Fluke DMS software. Designed for field service technicians, the Fluke FLK-115/TLK-225-1 Safety Bundle offer can be seen, along with other ‘Fluke Specials’, on the company’s website.